The opening of the Bonnet Carré spillway draws a crowd. It has only been opened 13 times since its construction in 1931, five of which have occurred in the past decade. When the river approaches a flow rate (volume of water passing a point per time) limit of 1.25 million cubic feet per second (cfs) at the New Orleans gauge, the Corps begins the process of opening some of the 350 bays on the nearly 1.5 mile long concrete weir structure. People flock to watch the elevated Mississippi River pass through the control structure into the much lower floodway (the nearly 7000 acre piece of land that water flows through before entering Lake Pontchartrain) on the other side. It is a spectacle for locals who post up with food and drinks for some hydraulic entertainment. After all, this spillway keeps the city of New Orleans and other communities south of the city dry by taking pressure off of the first line of flood defense: the mainline levee system. The Bonnet Carré is located approximately 33 miles upriver from New Orleans (Fig. 1). Engineers choose this location because the Mississippi River had naturally crevassed (broken through the natural levee) there many times historically. Thus, the location was a natural area for the Mississippi River to go during large flow events. 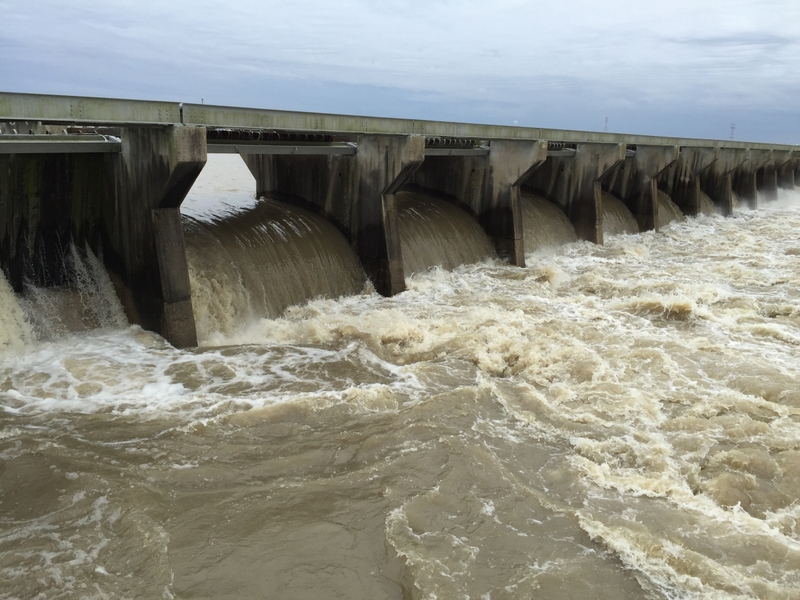 At maximum capacity, the spillway can divert 250,000 cfs of river water into Lake Pontchartrain, reducing the stage of the river passing through New Orleans by up to 3 feet in some years. This year the spillway was open on Feb. 27th and remains open. 2019 marks the first time the spillway has been opened in two consecutive years (2018 and 2019). The estimated frequency of spillway operation is once every 10 years. This got me wondering. Is it just a coincidence that we have had to use the spillway so frequently in the past decade compared to the half century prior? Although it is tough to find an exact answer to this question, many theories have been proposed. A paper published last year in Nature by Munoz and others attributes ~25% of the changes in the frequency of high flows over the past 150 years to climate and ~75% of it to the direct human modifications such as levee construction and land use change. It is difficult to determine whether flows are statistically higher today than they were 100 years ago due to the relatively short amount of time that we have been collecting flow records on the Mississippi River. In order to extend this timeline by almost 500 years, this study used tree rings and sediment cores (a vertical sample drilled into earth) from 3 floodplain lakes within the Mississippi Valley. Sediment records flooding through changes in the sizes of particles deposited while tree rings record flooding in the relative size of vessels within a ring. A relationship was established between these markers and the historical flow data to develop a flood time series back to the 16th century. From this analysis, the study found that the frequency of a 100-year flood event (a flood event with a 1% chance of happening in a given year) has increased by 20% over the past 500 years. Both climate variables examined in the study were correlated with flood frequency indicating that climate does in fact play a role. To determine the proportional contribution of each factor on the relative increase in flood frequency, the study modeled flood size over the past 150 years using just climate data and compared that to measured flows. They found that only accounting for climate significantly underestimated maximum flows by about 75%. Munoz and others show that many of the modifications implemented within the Mississippi River Basin over the past 150 years, in combination with climate, have actually made floods bigger. Levees can protect land but in doing so they also contain floods within a smaller area driving up the maximum flood heights. This brings us back to the history behind the construction of the Bonnet Carré. In 1879, congress established the Mississippi River Commission to develop and implement a comprehensive plan to prevent destructive flooding within the Mississippi River Valley. Prior to the 1927 flood (see here for information about this catastrophe), this agency held a “levees only” policy, meaning that the response to large floods was to continually increase the height of the levee system to above the elevation of the previous flood. Other flood control alternatives such as reservoirs, floodways, and channel control measures were largely dismissed. It was only after the devastation of the great flood of 1927 that opposition to this levees only policy began to change to one that included multiple lines of defense. This change in opinion resulted in the establishment of 4 main floodways: the New Madrid floodway, the West Atchafalaya floodway, the Morganza floodway, and the Bonnet Carré Spillway (Figs. 2 & 3). Only the Bonnet Carré spillway has been used more than twice. In 2011, it was used in tandem with the Morganza Spillway due to dangerous flooding on the Mississippi River for the first time. Obviously the decision to move from a levees-only policy to one that included floodways has been extremely valuable. I hope the success of this policy change and the infrastructural updates that were required remain fresh in the minds of policy makers as we enter increasingly uncertain times about what climate change may mean for future Mississippi River flows.